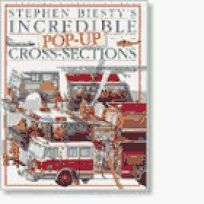 The artist who brought new meaning to the term ``cross-section'' adds another dimension to a popular work in Stephen Biesty's Incredible Pop-Up Cross-Sections. Inventive paper engineering enhances Biesty's typically intricate dissections, here illustrating the workings of a fire engine, rescue helicopter and space shuttle on three oversized spreads. In an especially nifty spot, a pull-tab sets into motion a small copter's whirring blades (Dorling Kindersley, $16.95, 6p, all ages ISBN 0-7894-0199-1 Sept.).